This week we welcome a fourth permanent co-host to the program, the inestimable Judge Jen, a.k.a. DCC RPG stalwart Jen Brinkman! 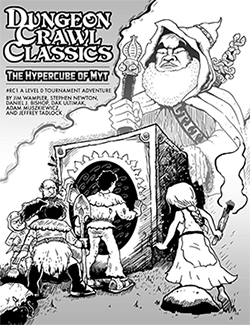 And if that wasn’t enough shock and awe for you, this episode we’re also welcoming back for his third appearance – fourth if you count the infamous “lost pilot” – DCC RPG scribe Manly Michael Curtis, who’s going to talk with us about his forthcoming adventure “The Chained Coffin,” which is the latest kickstarter from Goodman Games. Wonderful episode! Great to hear Michael on the show again. I loved listening to how you guys broke into the industry. Chained Coffin sounds awesome. I went ahead and backed it on Kickstarter. Looking forward to the spinning thing! Perhaps it wasn’t made clear to you that your job on the team was to kick the gentlemen in the pants and make sure that they produce podcasts frequently enough to feed my addiction? I blame myself for this. But what’s done is done. Now, please go shake the “Judge Js” tree and produce another podcast! I have brought this concern to upper management. The Acolyte Ascension contract saw many revisions before it made it to me, and much of the fine print was missing. As a result, I have enjoyed greater success rates when herding cats. Your patronage is important to us. Please continue to make your Fort saves until the next fix is available. Sold…sight unseen! I just backed the Chained Coffin kickstarter after listening, making it the first kickstarter I have ever backed. You guys are good. And your correct Jim, I did hook up with Daniel Bishop and received the Revelations of Mulmo(which is full of all kinds of great stuff by the way). Keep up the good work and welcome aboard Jen. Great show! I agree with Mr Bishop- More please!